The SSC team of Jagranjosh.com has prepared topic wise study material for SSC CGL Exam. The SSC team of Jagranjosh.com has prepared topic wise study material for SSC CGL Exam. The explanation of concept is done in way that every aspirant can easily understand the basics and tricks for the topic. The sample questions after concept study proves to be a milestone for understanding the concept very well. Data is defined as a rough collection of facts and figures which can be used to form a meaning information. Directions (Example) Read the table carefully and answer the questions that follow. Example 1. In 1994-95, the demand for flats is approximately what per cent of the total demand for steel? Pie chart is called so because of its shape. Each slice of a pie is allowed to each category and shows the portion of the entire pie. In the questions of pie chart, the total quantity is distributed over a total angle of 360°.. Directions (Example) Refer to the following pie chart and answer the questions that follow. Example 1. In year 2000, if India had total expenditure of Rs 120 billion, how many billions did it spend on interest on debt? A bar is a thick line whose width is shown merely for attention. In this method of data representation, the data is plotted on the x and y axes as bars. Directions (Example) Study the following graph and answer the questions given below. Example 1. 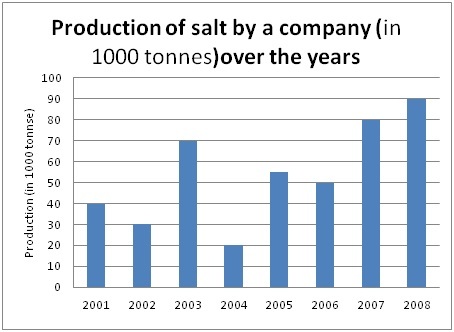 What was the percentage increase in production of salt in 2008 compared to that of 2001? Directions (Example 1-5) Read the given information carefully and answer the question given below. 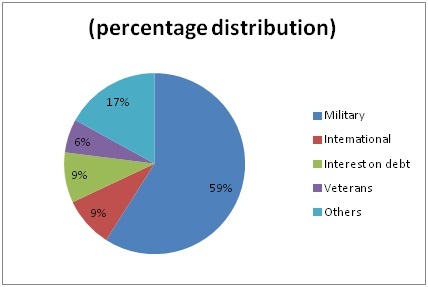 Population of five adjacent areas of a town, in the year of 2010, are represented in the following pie chart. The ratio of the numbers of males to that of females in these areas are stated in the table below. The total of the population in all the five areas is 72 lakh.